Disabled rights campaigner Lord Ashley of Stoke has died aged 89. The former Labour MP for Stoke-on-Trent died on Friday night after a short battle with pneumonia, his family said. Jack Ashley represented the city for 26 years until he was made a Labour peer in 1992. He was deaf for most of his political career. Labour leader Ed Miliband described him as "an extraordinary campaigner for equal rights for people with disabilities". BBC presenter Andrew Marr, who is married to the peer's columnist daughter Jackie Ashley, said he had also won major victories "for the victims of the drug Thalidomide, for victims of Army bullying, and for victims of domestic violence". Jane Ashley paid tribute to her father via Twitter saying: "RIP Dad - my wonderful father, Jack Ashley, Lord Ashley of Stoke, who was so loved and inspired so many people." Born in Widnes, Lord Ashley was elected as an MP in 1966 after having worked as a BBC journalist. Two years later he lost his hearing following an unsuccessful ear operation. He prepared to resign his seat, but after a crash-course in lip-reading he was able to continue to serve in the House of Commons. "Early on when I first lost my hearing, I think people were a little fearful about attacking me," he said. "But as I re-established my confidence, that soon fell away." Mr Miliband said: "Jack Ashley turned his own tragic experience of losing his hearing into a mission of courage and determination for deaf and disabled people. "There are many millions of men and women with disabilities who will have better lives thanks to Jack Ashley. "He succeeded in changing the law and in changing attitudes. Anti-discrimination legislation for people with disabilities would not have happened when it did without his tenacity, his campaigning and his support. 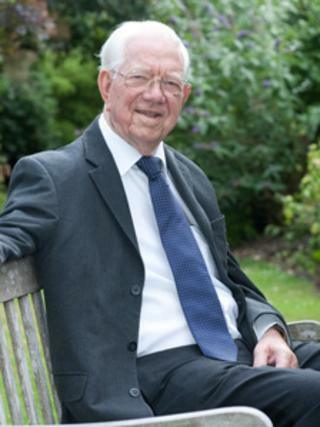 Prime Minister David Cameron said he was saddened to hear about Lord Ashley's death. "He was a tireless campaigner for disabled people and had a huge impact, not just through his charity work and pushing for legislation in Parliament, but also in changing attitudes," he said. Lord Ashley had also been president of the Royal National Institute for the Deaf. Now renamed Action on Hearing Loss, the charity's chief executive Jackie Ballard described him as "a great role model". "Jack never stopped working for what he believed in right up until his death and would always speak up on behalf of people who are deaf or disabled," she added. "He was a tireless campaigner and there are many people in this country who have a lot to thank him for." Dame Anne Begg MP, the first permanent wheelchair user to be elected to the Commons, described Lord Ashley as "a trailblazer who made it possible for me to even think I could be an MP". Tristram Hunt, Labour MP for Stoke Central, said: "Everyone in Stoke-on-Trent remembers him as a great ambassador for the city and an inspirational fighter for people with disabilities." Labour MP Rob Flello, who currently holds Lord Ashley's Stoke-on-Trent South seat, said he was still remembered with great affection in the area and the local Labour party would find a way of marking his life.